‘Not more corn fritters’, I hear you say. I like corn fritters and, as we had ricotta in the fridge, I was on the look out for a recipe that would use it up. I went into eatyourbooks and searched ‘ricotta’. This recipe took my fancy. They are more like corn pikelets, if you can imagine such a thing. Therefore, if you like corn fritters and are partial to pikelets, this recipe may be for you. We enjoyed them. Make your own pesto or use a brand you know and love. I am no pesto fan but this one was a shocker. Never again. It is destined for that big pot I use to make my puppies’ dinner. They are not fussy about the quality of their pesto. In fact, they love whatever goes into the pot. Last week, it was half a jar of chilli jam. The recipe is by Louise Pickford. It appeared in the Australian Delicious magazine, February 2010. It serves 4. Put the cherry tomatoes in an oven proof dish, sprinkle with olive oil, salt and pepper. Bake until the skin begins to wrinkle and the tomatoes begin to collapse – about 20 minutes. Beat the buttermilk, eggs, ricotta and flour together in a bowl. Season with salt and pepper. Stir in the corn kernel and chives. Use ⅓ cup of batter for each fritter and cook 2 or 3 at a time. Cook until brown then flip and brown the other side. Don’t have the heat too high because you want the batter to cook. 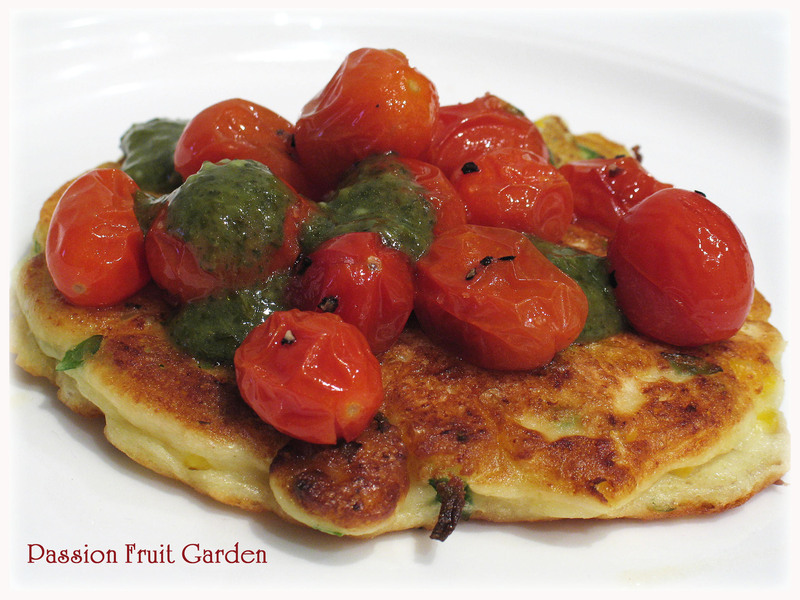 To serve, put a fritter on a plate and top with tomatoes, pesto and torn basil leaves. This entry was posted in Corn, Eating your bounty, Patties and Fritters, Tomatoes, Vegetarian, What's for dinner? and tagged Corn fritters by Glenda. Bookmark the permalink. I have those ingredients waiting to be used. This may be dinner tonight! Excellent, Its great when you find a recipe and you have ALL the ingredients in the fridge, isn’t it? Thanks for visiting. I love corn fritters, and these loook super delicious ! Hi Claire, it’s good to meet another corn fritter fan. You’ll never hear me complain about another recipe for corn fritters! As long as fresh corn is in the market, I’m looking for ways to use it – and fritters are a delicious way to do so. But here’s how I am, I don’t have any ricotta around, but I just saw some unused tofu waiting in the fridge – now, I know tofu doesn’t taste much like ricotta, but it does have the same ‘cheesy’ texture, and it is good for you – so I’ll give that a try. I think I remember you saying you don’t care for tofu, so unless you want to know how it turns out, I’ll not bother telling you. Oh yeah – what’s a pikelet? They look absolutely divine Glenda!